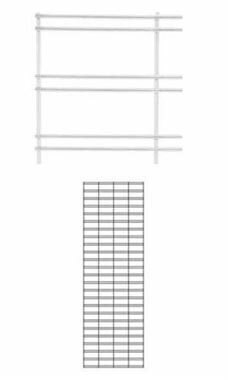 Show off your merchandise in style with this beautiful White Slat Grid Panel. In a stunning white finish, this piece will look great on your wall! The panel measures 2' x 6', and is made entirely out of sturdy wires that are neatly spaced in sets of 2, with a large space in between each set. Complete your display with grid accessories including shelves, peg hooks, and faceouts. Due to packaging and shipping purposes, these pieces must be ordered in increments of 2 panels. In stock and available for same day shipping. I continue to be totally blown away with the quality and super fast delivery!!!!! !